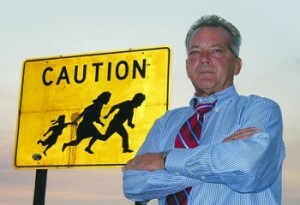 Minuteman Project co-founder Jim Gilchrist recently announced that he was “considering” reviving the nativist border watch group. And now he’s made it official, announcing that he will organize a Minuteman border patrol in May of 2015. Gilchrist clearly hopes to capitalize on the mounting right-wing outrage over the humanitarian crisis at the U.S.-Mexico involving Central American refugee children. The Minuteman Project’s “Operation Normandy” has been launched as of 1200 hours Monday, July 7. This event will dwarf the original Minuteman Project of 2005. I expect at least 3,500 non-militia volunteers to participate, plus uncounted groups of militias from all over the country. If you are familiar with the Normandy invasion of France in 1944, then you have an idea how large and logistically complicated this event will be. However, there is one difference. We are not going to the border to invade anyone. We are going there to stop an invasion. Our federal, state, and community governments have failed to address and fix this calamity. In the spirit of our nation’s Founding Fathers, it is once again time to bring unprecedented national awareness to the decades-long illegal alien crisis jeopardizing the United States. Participation is open to everyone and there is only one rule: whatever you do, stay within the rule of law. It will take 10 months to recruit, organize, and launch this event, and it will cover the porous areas of the 2,000-mile border from San Diego, Ca. to Brownsville, Texas. The Minuteman Project gained national traction in 2005, but internal turmoil, accusations of vigilantism and criminal charges against some of its key figures, including a former leader of the movement, Chris Simcox, led to its demise. The more detailed, and fully accurate, description of the “criminal charges” against “some of its key figures” would include multiple murder charges filed against onetime Minuteman leader Shawna Forde, a close associate of Jim Gilchrist who on May 30, 2009, led a gang of killers into the rural home of an Arizona family and proceeded to murder a 9-year-old girl named Brisenia Flores and her father, Raul “Junior” Flores. They also shot the girl’s mother, a 30-year-old woman named Gina Gonzalez, who eventually drove them from her home in a hail of gunfire, and wound up providing the testimony that put Forde and her chief co-conspirator, Jason Eugene Bush, on Arizona’s Death Row. The “criminal charges” against co-founder Simcox are only somewhat less disturbing: He is currently in the Maricopa County Jail, awaiting trial (now scheduled for September) on three counts of child molestation. But Gilchrist held forth at length for the KPHO reporter in a Skype interview, claiming: "We're trying to recruit thousands of people to cover the porous border areas from San Diego to Brownsville, Texas," and warning, as he has all along, that he will need 3,500 volunteers in order to be successful. Gilchrist also promised that there would be no extremist violence or murderous plots emerging from this iteration of the Minutemen: "The rule of law means you do not put a hand on anyone. You do not talk to anyone. You do not confront anyone. You report to Border Patrol," Gilchrist said. He also defended the character of the militias that claim to be forming along the border even now. "They're not these man eating ogres they're made out to be," Gilchrist said.